Would You Bee Mine? Playing with Monograms! Oooooooh! I’ve been playing with monograms again! You know what I love about embroidered monograms? I love the fact that they are self-contained projects that don’t take very long to work up into their finished glory. They can be stitched on practically anything textile-related, and voilá – you have a Finished Thing! Fairly simple monograms – like the ones I’ll show you today – can be whipped up in no time. A weekend of intermittent stitching will easily get you to the finish line! With Valentine’s Day tomorrow, I thought I’d share a glimpse of the two latest letter styles I’ve been playing with. Admittedly, there’s a bit of sugar shock going on here, but…now and then…we all need a little something sweet in our lives, don’t we? These concoctions started out as an adaptation of an old monogram alphabet from Alexandre. The original one was rather plain and I thought it was a bit boring. But when I started thinking about it, I realized that it could be fairly easily adapted into all kinds of fun approaches. So I started with hearts…and that lead me to other things, like the bees, below. The re-drawn letters have been sitting half-finished on my computer for the last year or so. Finally, I started stitching samples last week. To work up the first sample in the heart design, I rummaged through my linen boxes and found a pre-finished blank cotton towel with red and white trim – a perfect canvas for some quick stitching that would develop into something giftable. Knowing that some folks don’t have access to floche, I also started a sample using regular floss, mixing up the stitches a bit. This is as far as I’ve gotten on that particular sample, but I plan to finish it today. Once the first heart sample was finished, I launched into my second idea for these particular letters. This sample was such fun, and I can’t wait to work up more of them! I think it’s the activity going on in it. It just makes me want to keep stitching! I still have a lot of work to do on this alphabet and a couple more interpretations I want to play with before making it available. I suppose I was just so excited about actually finishing a couple stitched samples, that I couldn’t resist showing you. I feel like I’ve actually accomplished something for a change! Besides, it seemed like a good day to share something a bit heartsy and sweet. If you want to know how heartsy and sweet I am when it comes to Valentine’s Day, you can read my own poetic masterpiece about Valentine’s Day here. 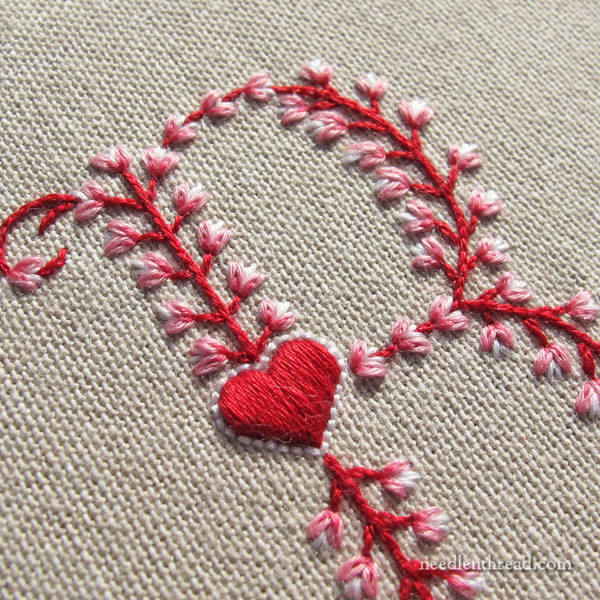 You’ll also find a free hand embroidery pattern for a pretty little heart in the same article. And if that doesn’t do you for Valentine’s patterns, you might enjoy this Heart o’ Flowers design. You’ll find a gorgeous stitched version of the same design here, worked in silk and goldwork. Wishing you a cheery Monday all around! Oh, I thank you for this wonderful work an the pictures! They are water for my really spring-thirsty mind today. I was in no good mood the last days because of the dark, windy and cold weather here. Thanks for the lovely colours and little flowers. And the beehive with bee *sigh* a foretaste of more life outside in nature. I absolutely love the bees and am hoping to see more. You made my day; thank you. Thanks for the chuckle–loved your poem and especially that last verse. Also enjoyed the beautiful goldwork heart o’ flowers. Mary, I LOVE it! Thanks to your steady influence of beautiful stitches in my life, I’m actually working on my first monogram right now…a B! And I’m falling hard and fast in love with Floche! Can’t wait to see the rest of that Bee you got going on! I can’t wait for this! You always have such lovely projects/ideas. and I shall be looking forward to when you make these available. Have a grand day. These are both wonderful! Hope they will someday be available in one of your complete sets, I think I could give them a whirl! Happy Valentine’s Day to you! Love it! Am currently using your Monograms (leaves and dots) to make a handkerchief from my sweetheart. Last year I made your Heart O’ Flowers into a mini book cover to hold a flip notebook. I hope you offer them reversed, so that those of us who are LAZY and want iron-ons can satisfy their need to stitch without the tediousness of transferring. I loved your article about Ezio Anichini. I’ve spent the last month looking at William Morris designs to work into a free embroidery. I bought the books on xstitch and needlepoint, but I’d love to see some in less structured form. Morris hated needlepoint, he felt that it was too limiting and that stitchers lost their ability to use multiple stitch types by continuing to needlepoint. How funny that 121 years later, all you can find is his work translated into a form he abhorred. I love that you can see the drawings of Ezio. So much easier to translate them into embroidery! I often see Ezio postcards on ebay, illustrations from the Divine Comedy. Those letters are beautiful! 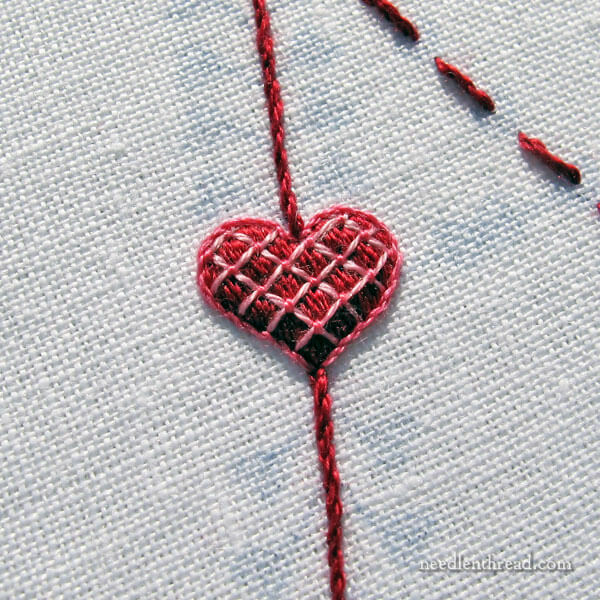 I love the smooth satin stitch heart on the first one, the backstitch outline makes it really pop. The bees are adorable too. I can just picture these on towels as gifts. So lovely! The poem is a classic! Sweetly Victorian with a modern twist! The Heart O’Flowers is such a pretty design – as a textile pattern or in an adult coloring book, too. Thank you Mary! I love your “heartsy” treatment of the monogram. Thanks so much for the inspiration, and happy Valentine’s Day to you. I can’t tell you how much I enjoy your emails. Your creativity and clarity are superb. Your hard work, information, videos and beautiful embroidery brighten my day as I’m sure that they do for all of your followers. Sorry for the sugar overload from me, but it’s absolutely true, no hyperbole. And on top of that are your wonderful contests….thank you for all of your contributions to our art! How fun. I especially love the bees. Looking forward to more. The first monogram is lovely, so feminine. I love bees and will look forward to seeing the finish. I have been reading all your monogram posts lately; I have the opportunity to take a weekend course by the RSN for a monogram in blackwork and goldwork in Glasgow in May. It will be my first instruction with an RSN tutor and I am so excited! I have been reading your articles on Monograms, old and new, in preparation. I have done blackwork quite a lot, but never goldwork, so I’m a little nervous. Your articles are always clear. I loved your article about Ezio Anichini, also! You hand the red heart with the letter B also below that was a picture of a bee and purple flowers. It was posted Feb 13 would you be mine post. Hi Mary, thanks once again to show us your wonderful work. 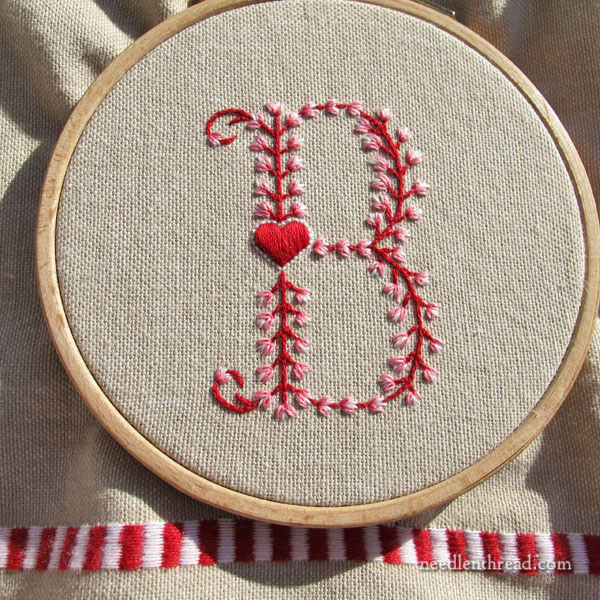 I do really love the embroidery you did on that letter B. Can I ask you what type of stitch you used all around the red heart (the white, kind of dotted border)? I sooooooo love it!! Something so simple yet so beautiful!! Thank a million and thanks for the teaching you do! Hi, Simona – that’s just backstitch, so very simple! 🙂 glad you like it! I always look forward to your newsletter. It’s always inspiring and gives me a little push I sometimes need. 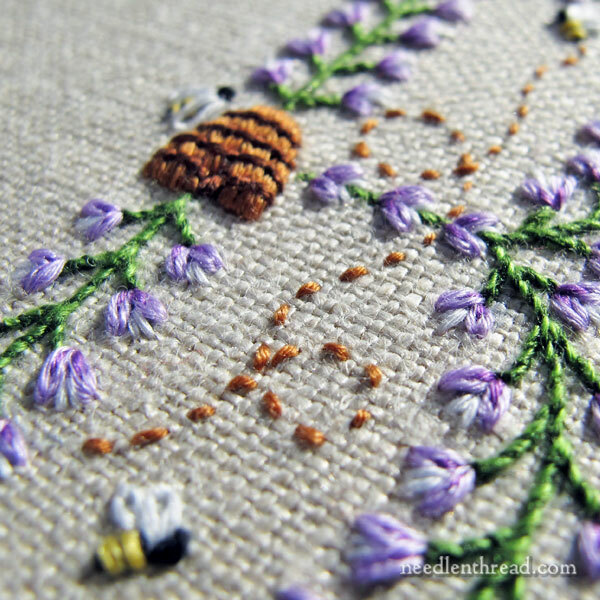 I really like your bees and am thinking about one I can stitch for our daughter. Your work and colors are always so beautiful. Love seeing everything you do. Estimada Mary: soy Argentina,tengo 58 años y soy médica.Me encanta bordar, es uno de mis hobbies. Mi problema es que no tengo manejo del idioma Inglés.Me gustaría saber si se puede comprar uno que venda con las instrucciones en español.Muchas gracias!! !Admiro los trabajos que podés hacer…sos una artista…Cariños!